I have been trying to work my family into a healthier and cleaner lifestyle without all the terrible things we rely on and add into our bodies over the last couple years. This has of course included things like my gardening. As I am sure you all know I also need to lose quite a bit of weight. I seem to have hit quite a few health road blocks over the last year as well with this. Without trying to make any excuses or putting off the priority of my health, I was waiting until we moved to start anything. This unfortunately has taken longer than expected and become what started out with a better plan and turned into a big excuse. So when I discovered the company Raw Green Organics and learned about their wonderful products, I knew it was a company I truly needed to work with. "At Raw Green Organics, we believe that without our health and planet – we have nothing. It's serious business and we're in the business of making it better." There are statements that they make in their vision which are put bluntly and very differently that most other companies. It really makes you think when they say..."Reduce the ubiquitous presence of toxic chemicals in our natural environment (air, soil, oceans, etc), man-made environments (homes, schools, offices) and our personal environments (industrial pollution inside our own bodies)"
I was sent over the awesome RawJuvenate Complete Organic Detox 2 Week Starter Kit plus the Organic Vegan Vanilla Protein and a BlenderBottle® Classic™ Shaker. The 2 Week Detox Kit includes Organic Super Green Drink Mix, Vegan Chocolate Protein Powder, Super Probiotics Capsules, Super Fiber Capsules, and Super Aloe Capsules. This two week system is designed to help support your digestive system in an all natural way. An important part of a detox and cleanse is something that is gentle enough to use daily without feeling sick or stuck in the bathroom for the duration of the cleanse. Each product helps in it's own way one day at a time. 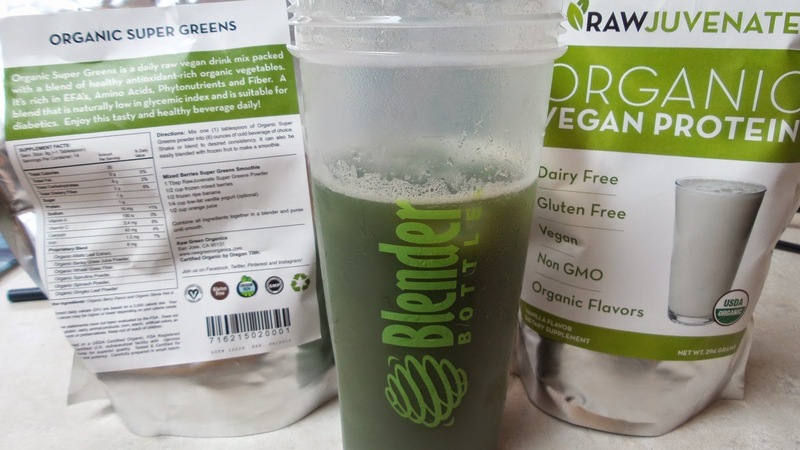 Now although I have not started on a complete juice/organic diet, I have been replacing my morning meal and snack with a mix of the Super Greens and Vanilla Protein. It has been an easier way for me to slowly drop my meal/calorie count. 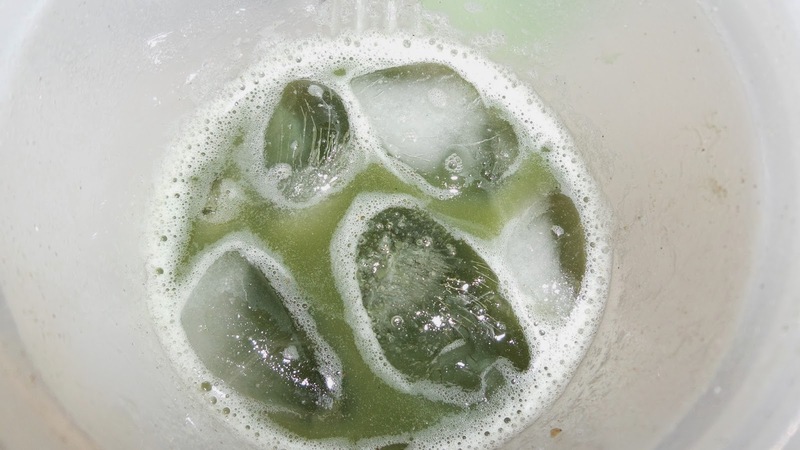 "Organic Super Greens is a daily raw vegan drink mix packed with a healthy, antioxidant-rich organic vegetable blend. It's rich in EFA's, Amino Acids, Phytonutrients and Fiber. A blend that is naturally low in glycemic index and is suitable for diabetics." Being that I was diagnosed recently with having a high complex sugar count as well as something called Sponge Kidneys, I have been trying to lower my carbs and any type of sugar intake. THIS makes it easy! Unlike other Protein powders, the Organic Vegan Vanilla Protein is 100% vegan, organic, gluten-free, dairy-free, and soy-free! Not only do you not have to worry about the normal fillers but you know you are drinking something which even though it is satisfying, it isn't filling making you feel bloated in any way! 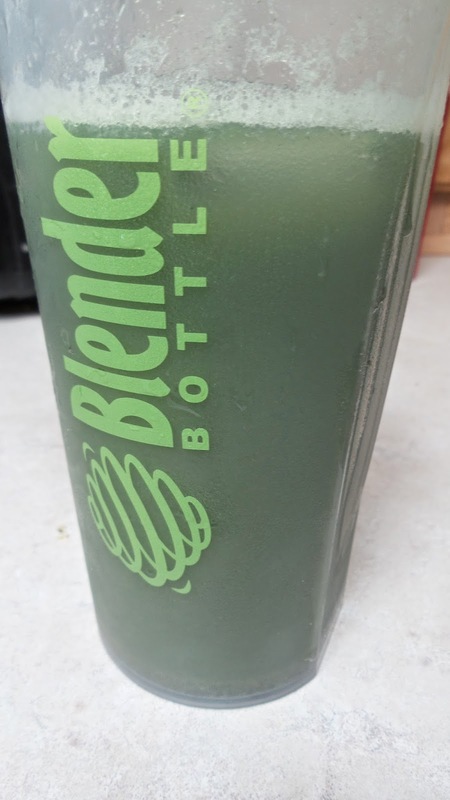 I love using the BlenderBottle® Classic™ Shaker to mix these powders with water each day as the metal mixer works better than the screens you get in other shaker bottles. The capsules all help in different ways as well. The Super Probiotics help "maintaining healthy flora balance in the gastrointestinal tract". The Super Fiber provides a natural blend of allergen free fibers to help with healthy bowels. Super Aloe keeps from feeling bloated and relieves constipation. It has a natural laxative effect. None of the above made me feel sick after taking AND most importantly I was not rushing to the bathroom constantly. I felt like I went normally when I was ready and not stuck sitting in there for days! Mixing the Greens and the Protein only has 118 calories in each serving/glass. You know I'll be honest about how bad most dieting drinks taste and this one was great! You can mix your powder with juice, water or any type of milk. I've been mixing mine with water and it tastes like a vitamin water but I'm sure it would taste like a fruit juice or flavored milk when mixed with the others. I have to say again this wasn't like most cleanses where you are stuck in the bathroom for hours and days. I actually enjoyed taking this. I definitely noticed a difference in my skin with a reduction in blemishes, less oil, and no dryness. I even noticed a difference in my natural energy. I did notice I felt less bloated and as if I lost a little water weight. Most importantly, I noticed a major reduction in appetite! I felt full most of the day and was completely content with snacking and small meals. Recommendation: As much as I think this price is kind of outrageous, I actually liked this product for once and it worked for me. This says a lot since I have tried several non-exercising options to lose weight. They also have available several other super foods and products which I'd like to try although I was quite happy with this one! 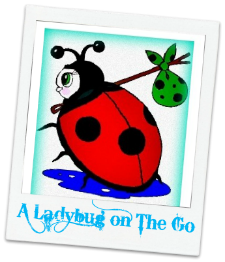 Giveaway: Raw Green Organics is going to give one of A Lucky Ladybug's lucky readers the same items I received including the RawJuvenate Complete Organic Detox 2 Week Starter Kit of their own! I've been considering going back to a shake in the morning to give my day a kickstart, and keep seeing Rawjuvenate. I love how many nutrients it's filled with, and the extra probiotics, so I don't feel like I'm missing out on yogurt. I would love to try Raw Green Organics because I am a vegetarian and I am trying to eat healthier. Also, I have never done a cleanse before and I'd love to try one. I'm vegan and I love probiotics in any way! I'm vegan but it's been a while since I've been a healthy vegan, far too many vegan treats and no greens lately. This would be a great way to get back on track and feel a lot better with extra nutrition! I like the nutrition provided by greens and would be grateful to try raw green organics. Thank you for the giveaway. I'm vegan and always open to trying new things. I haven't done a cleanse before and this one seems like a good one to start with! I'm not vegan, but looking for a protein powder that isn't whey (dairy). I would love to try raw green organics. I am always trying to kick the health factor in my veg diet up a notch. I love green supplements but haven't tried this one. Thanks! We're trying to eat healthier and lose weight. We're tired of processed foods.